The tipping point for wide acceptance of convertible crossovers is coming, and Volkswagen will soon throw another few thousand pounds on the scales. The People’s Car maker launched the standard T-Roc in Europe last November and says it has 40,000 orders on the books already. With VW predicting crossovers will comprise 40 percent of company sales by 2020, the T-Roc cabrio will be one of the 20 crossovers the carmaker plans for sale globally to satiate demand. We get the feeling Volkswagen’s laid out a biennial grooming program to get us ready for the announcement. 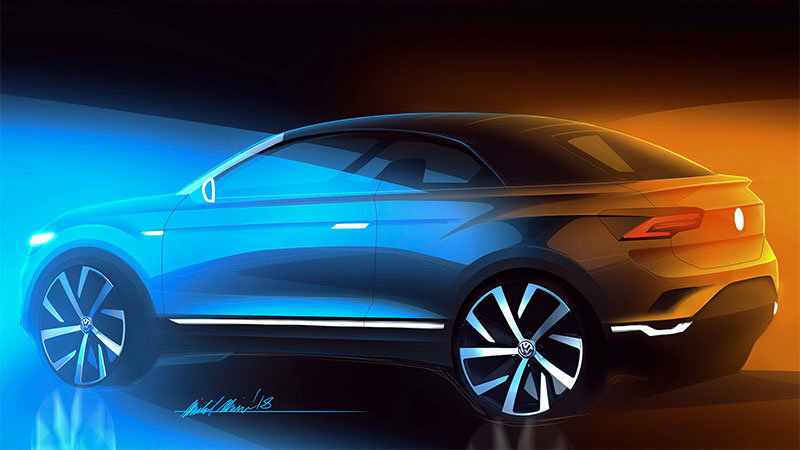 The original, Golf-sized T-Roc concept teased us with a two-panel targa top at the 2014 Geneva Motor Show. Two years later, VW figured we were ready for a conceptual take on the full monty, so it brought the truly convertible, Polo-sized T-Cross Breeze to Geneva. Two years later, we get the news that the dreamy curiosity is going into production. Two years hence, we’ll have it. Or Europe will have it, at least. VW hasn’t brought the T-Roc to the U.S. and hasn’t mentioned any plans to, so we might watch this product assault from afar. Based on the design sketch posted with the press release, it looks like the production unit will come with a fabric soft top, same as on the Range Rover Evoque Convertible. Don’t fret if you’re keen on this distant nectar; this will be the Volkswagen Group’s first convertible crossover, but it certainly won’t be the last, and VW could be saving the U.S. market for a hardtop convertible Audi crossover.